Ok, one more thing. I had to add this picture we got today of Jack and Brooklyn because it is the first time we have been able to hold them next to each other. We discovered something when we did – they look exactly alike!! Ryan has a strong resemblance to them both as well. We think Britton and Lila probably look a lot like each other, but it’s too early to tell. Anyway, just wanted to share. We got a very cool surprise today in the NICU today as Casey was holding Britton and I was holding Jack. I’m not even sure what started it, but one minute we’re just sitting there chatting with the nurses and the next thing you know, we’ve got nurses bringing us the other three babies for a quick photo op!! It was really cool to have them all side by side and the pictures we got are absolutely PRICELESS!!!! 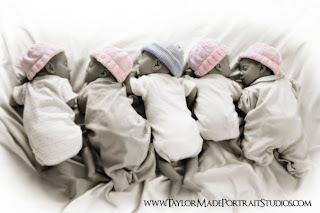 The babies are in birth order in the picture from left to right – Brooklyn, Britton, Jack, Lila, and Ryan. To be honest, I got a little nervous doing this because it meant that Brooklyn, Lila, and Ryan were disconnected from all of their monitors to make this happen, but we were surrounded by nurses and we only got to do this for a few quick minutes. Don’t let my nerves fool you however, the babies all continue to do very, very well. They each still have their own little issues that they need to overcome before they are allowed to come home. Brooklyn needs to get better at eating, Britton needs to grow, Jack needs to stop having heart rate drops, Lila had a pretty big setback today, and Ryan just needs to eat, eat, eat! Lila’s setback was a really scary episode that quickly reminds us how important it is for the babies to be so closely monitored. For some reason she had a major heart rate drop coupled with a prolonged episode of very low oxygen saturation that required her nurse to artificially breathe for her for about four minutes. She never completely stopped breathing, but her oxygen saturation was too low to allow her to work through the problem on her own. This was out of character for her, but apparently isn’t an uncommon event for preemies to experience. She’s ok, but this little episode means that she will be in the NICU for a minimum of seven more days, probably longer. One other quick note – Jack had his circumcision performed this evening. Casey’s ob/gyn, Dr. Stephanie Reich performed the operation and reported that all went well and Jack did not make a peep. Atta boy, Jack! It is possible that one or two of the babies will be coming home in the next 7-10 days, but it’s really unclear at the moment. They are all doing very well, but these lingering issues with eating and breathing have to go away entirely and stay away for a good seven days or so before they can think about sending them home with us. 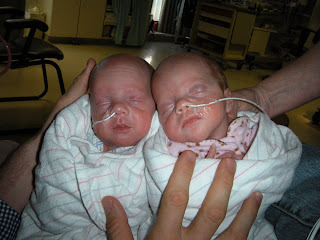 Please continue to pray for their growth and maturity with eating and breathing!!! P.S. Eliot is really into calendars and loves keeping track of the passing days on the calendar in her room. She gives us daily updates of lunar events (“Daddy, it’s a full moon tonight!”), holidays, and other notes listed on the calendar. I only mention this because she just ran out of her room to inform us some important news – tomorrow is Flag Day in Mexico…very exciting stuff!! As we’ve come to find out, white males typically do not perform very well in the NICU. They don’t eat well, they don’t grow very well and are generally outperformed by their female counterparts. White males have apparently done so poorly in their NICU stays that they have earned themselves a nickname – Wimpy White Boys. Well, I am proud to say that my boy, Jack William, is an exception to the rule! Not only is he doing well, he is outperforming all four of the girls. He is the first four pounder, weighing in at 4 pounds, 2.5 ounces, he is the first one to be moved out of an isolette and into a regular crib, and if he keeps it up, he is likely to be the first one we get to bring home! Go Jack!! Though she is nowhere near as well off as Jack, Brooklyn is doing the best of all the girls. Ok, I may have exaggerated just a bit with that statement. Truth be told, Brooklyn is a close second to Jack’s supremacy. She was moved out of her isolette today and will stay in a crib if she can do well with the change. She weighs in now at 3 pounds, 12.6 ounces. Britton continues to be the baby of the bunch weighing in at only 2 pounds 12.3 ounces. The doctors are a little concerned that she hasn’t been gaining much weight so they are increasing her calories and monitoring her red blood cell and platelet count. It probably doesn’t help her weight gain that she is still the diva of the bunch. She spends much more time than the rest letting the nurses know about every little discomfort she experiences, of which there are many! I do not believe it will be necessary, but if she does not start picking up the pace, they are considering doing a blood transfusion to get her red blood cell count to pick up. Other than that, she is doing very well in all categories. Please pray for her to respond to the increase in calories and to begin growing faster! A bit of good news on Britton is that she is no longer on any oxygen support which means one less cord strapped to her face…yeah! We have wonderful news on Lila’s and Ryan’s hearts – they double checked the PDA’s that they had with great results! Lila’s PDA was completely gone and Ryan’s was classified as “trivial.” Thank you to all who prayed for their little hearts to be healed!!! Both are growing well – Lila weighs 3 pounds, 2.4 ounces and Ryan weighs 3 pounds, 8.2 ounces. Lila has been removed from oxygen support, but Ryan will be on it for a few more days at least. Four of the babies can now be held by grandparents as they can now maintain a good body temperature while bundled outside of their isolettes. Britton still can only be held skin-to-skin by me or Casey. Eliot has now held Jack and Britton while Grandma Stevie has held Ryan, Jack, and Brooklyn (that is Jack that Eliot is holding and Ryan that Grandma Stevie is holding in the pictures). All of the babies had a second cerebral ultrasound to check for problems with their brains and they found no issues whatsoever!! They will all undergo an MRI before they go home as one last check for any complications that may lead to long term developmental problems. 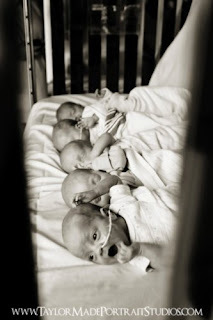 As of yesterday, the babies are one month old and continue to impress all of the doctors and nurses in the NICU. We expect that Jack will come home in the next 2-3 weeks and the rest will be home shortly after that. Then the real fun will begin! Oh, one more thing. Someone asked why Eliot was allowed to go into the NICU. 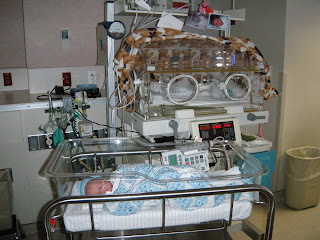 Seton allows siblings of any age to go into the NICU once they have been checked by the nurses to be certain they do not have any sniffling, coughs, etc. We are so grateful that Eliot has been able to experience the NICU with us!! 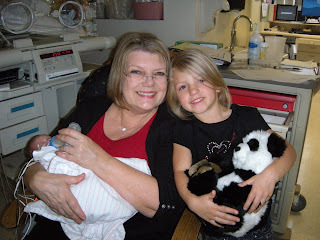 The Busy Life in the NICU…Busy…Good…Busy!! The blog title says it all, but the pictures say more…the last two days have been BUSY GOOD in our home away from home! On Tuesday, Ryan got a bath which happens about every three days for each of the babies, but often does not happen while we are there. So far, we have only been there to help bathe Jack and Britton. No sponge baths this time around – real baby baths – in a tub, with real water, soap, and all the other amenities of baby bath time. I haven’t gotten the chance to pitch in just yet – we have to be fairly economical with our NICU time so I am generally holding the other babies while Casey and the nurses tend to the bath. Thanks to the nurses for lending their photography skills! While Casey had her hands full with Ryan’s bath, I had my first opportunity to feed one of the babies a bottle and Jack was the lucky recipient of my baby bottle skills! I can’t explain what it is about feeding a baby a bottle, but it gets me every time. That’s the way it was with Eliot and I knew immediately that it would be the same with these babies the moment I got hold of Jack and got him going on the bottle. There’s something amazing about watching them work through the bottle, taking their little breaks to think about what’s happening and to catch their breath. I think it’s just one of those moments where you realize how fragile their little lives are and how much they depend on you for every ounce of their survival. Truly incredible!! Today was another busy day and we’ve got more pictures to prove it! While I held Ryan and Lila, Casey held Jack and Britton and Big Sister Eliot got her first go round on the baby holding carousel. As a proud mom and dad looked on, Nurse Melissa and Nurse Jeannie helped one suddenly serious 4 year old hold her biggest little sister. The look on her face was well worth the price of admission, but unfortunately this time I don’t think the picture quite captures the moment just as it was. The conflict of emotion was written all over Eliot’s face as she oh so carefully held our biggest three pounder – excitement, wonder, and curiosity were on the verge of bursting forth as she struggled to maintain her very solemn little face. This was serious business and she wasn’t about to let her excitement overtake the moment. It was absolutely priceless! Oh yeah, how could I forget?! That other picture is of super mom Casey holding three at a time – Brooklyn, Britton, and Jack! At one other time, she was “kangaroo’ing” Britton and feeding Jack a bottle all at once. Way to go Super-Mom-Elasti-Girl Casey!!! We got a great surprise when we showed up to the NICU with my dad on Saturday. Jeannie, one of the nurse superstars, said to us, “So, it looks like we’ve got three holders.” Huh? Say that again? Did you say THREE holders?? 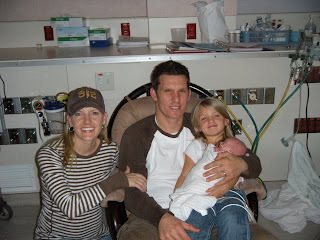 Up to this point, Casey and I have been the only “holders” – we were the only people allowed to hold any of the babies. 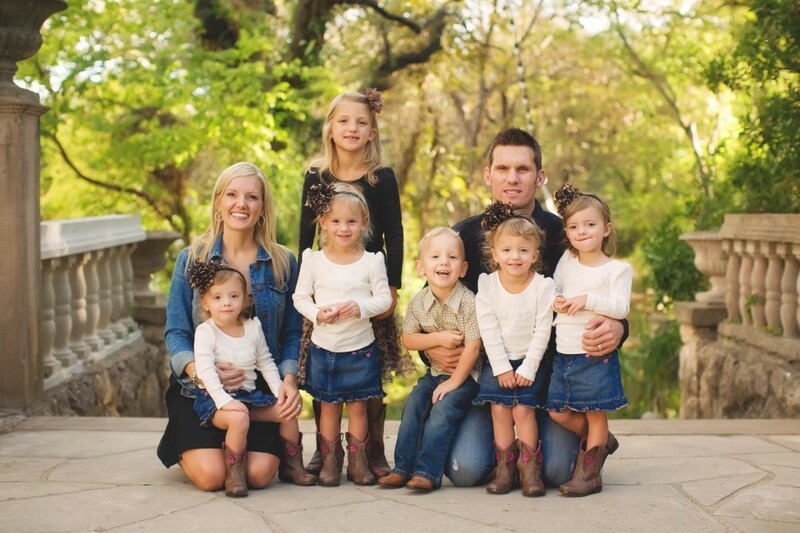 Jeannie, however, had a little surprise for us – Brooklyn and Jack had grown big enough to be bundled and held. 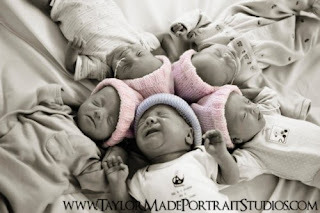 Apparently, when the babies’ weight gets to 1500 grams (somewhere around 3 pounds, 6 ounces) they can maintain their body temperature well enough that they can be held without being skin to skin with their holder. My dad, or “Bapa” as the grandkids know him, chose to relinquish his chance to be the third holder, however. My mom, “Nana,” wasn’t with us at the time and my dad wanted her to be the first to have the opportunity to hold one of these little bundles. So after church on Sunday, we made an unplanned visit to the NICU for the express purpose of getting Jack some well earned Nana time! My dad had to bow out again because the girls (Eliot and the two adopted little additions to the Jones family, Angel and Summer) couldn’t come into the NICU and time was limited, but I imagine he’ll get his fill of baby holding in the coming days, weeks, and months. To say the least, I think the visit went well and we are very happy to have new holders in the mix! P.S. Check out the website when you get a chance…we’ve updated the front page and I think it turned out really cool! !